You must be a member of the Hanoi Outdoor & Adventures Group to attend this activity. Would you like to join this group? Experiencing the Quang Ba Flower Night Market and then the Bưởi Market, the oldest market of Hanoi from 4 AM to 7 AM, early morning. The CNN said, the Quang Ba flower night market is one of the most interesting experience in Hanoi, Vietnam, especially during TET holiday. "The flower night market has long ago, the people living here do not remember exactly when it has started. The flower night market only known that is the former temporary market, and then the demand for people's trade, so people gradually expanded into the night flower market. On the flower night market of Quang Ba, people have a very different feel about a cultural feature in the lives of the people of Hanoi. The only light in the market is emitted by high-pressure light bulbs and the light bulb from above, which makes the market in a shimmering virtual light. 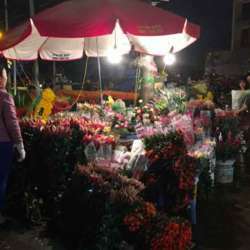 Quang Ba Flower Market is open all night but most crowded is around Protected content . The buyer and sellers streams into and out. Vehicles carrying flowers like roses, chrysanthemums, coins ... all kinds of colors bustling on the market. The flower night market is often becoming the fun of many people especially young people. There are many people who wanders the night to wander the market is not necessarily to buy flowers but simply to feel part of the nightlife in this land of thousand years of civilization." We are gonna shop bouquets and plans for TET holiday. We will meet at Protected content You take care of your own transportation. Please message me when you arrive. Fee: 150,000 VND/person, including local traditional foods and drink. Please pay on the event day. Please sign-out of the attendee list if you will not be going. I set up the attendee group for the trip on zalo/whatsapp for updates and communication. Please send to me your zalo/whatsapp number or add mine as my phone number. Thanks.